Ben-Hur, Quo Vadis, and King of Kings. 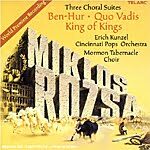 Erich Kunzel, Cincinnati Pops Orchestra; Mormon Tabernacle Choir. Telarc CD-80631. Miklos Rozsa was to film music of the 1940's through 1980's what Max Steiner, Franz Waxman, and Erich Wolfgang Korngold had been even earlier and what John Williams and others have been since. Rozsa, along with fellow composer of the day Dimitri Tiomkin, meant big, really BIG, film music. Epic scores for epic movies. And who better to present such music than Eric Kunzel, the most-popular record conductor of all time, with the Cincinnati Pops Orchestra and the Mormon Tabernacle Choir. The three movie pieces collected on this disc derive from suites that Rozsa began but never finished. They have been arranged and reconstructed by Daniel Robbins, Christopher Palmer, Julian Kershaw, Joseph D. Price, and conductor Kunzel. Each suite lasts about twenty minutes, with the disc containing over an hour of music. The unifying elements are Christ, Christianity, and the Roman Empire, with all of the music conveying pictorial variations of those central ideas. Things start off with director William Wyler's Ben-Hur, subtitled "A Tale of the Christ," starring Charlton Heston, Jack Hawkins, and Stephen Boyd, and released in 1959. It won Academy Awards for just about everything that year, including Best Music for Rozsa. It's probably the finest of the three scores represented here, with "The Parade of the Charioteers" the highlight. Next is Mervyn LeRoy's Quo Vadis?, starring Robert Taylor and Deborah Kerr, released in 1951. The Academy nominated it for quite a few Oscars, including music, but didn't win any. The music doesn't have quite the grand sweep of Ben-Hur, but the "Assyrian Dance" is most colorful. Things wrap up with director Nicholas Ray's much-underrated King of Kings, starring Jeffrey Hunter, released in 1961. It contains the best single motif in its musical argument, a theme still almost instantly recognizable. Needless to say, old-hand Kunzel brings everything off in the most lofty and imposing manner, with the Tabernacle Choir lending solemn and mellifluous support. The sound is pretty much what we have come to expect from this source; I mean, Kunzel has made about 800 such recordings now for Telarc, so all the folks involved should know what they're doing. The sound is big, to match the music; it's wide spread, wide ranging, open, vibrant, deep, resonant, not entirely transparent, but fairly realistic. I missed El Cid, though. It is my favorite Rozsa score. Oh, well. No Romans, I suppose. Charlotte Hellekant, mezzo-soprano; Nathan Gunn, baritone; Robert Spano, Atlanta Symphony Orchestra and Men's Chorus. Telarc CD-80665. 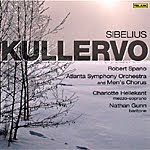 The choral symphony Kullervo (1892), which Jean Sibelius preferred to call a symphonic poem, was the composer's first large-scale work, written when he was in his mid twenties. He based the work's five episodes on the folk legends of Kullervo, a tragic hero of Finnish myth. But after its success, Sibelius said he regretted having written it, his not wanting to be typecast as relying only on nationalistic spirit. He apparently wanted to branch out and experiment and not be pigeonholed, and thus he shelved the work for most of the rest of his life, and folks didn't publish it until after his death. The tale of Kullervo is fairly melodramatic, beginning with a lengthy introduction recounting the character's youth, then his incestuous encounter with his sister, his going to battle, and his eventual suicide. Kullervo's misadventures make for an epic if somewhat bombastic piece of music, and it doesn't really stand up well to his later symphonies, so maybe he was right in abandoning it. Nevertheless, there are any number of felicitous moments that make the piece worthwhile, for me the section titled "Kullervo's Youth" standing out under conductor Robert Spano and his Atlanta Symphony forces. Oddly (for this label, which is usually pretty dependable), the Telarc sound is somewhat muted, slightly soft and round and not helped by Spano's rather somber reading of most of the score. I wasn't sure at first if it were simply my ears and the lateness of the hour affecting my judgment until I put on a comparison disc, Sir Colin Davis's London Symphony account on RCA, that things became more apparent. Not only were the RCA sonics clearer and more dynamic, Davis's interpretation was more exciting, more dramatic, more incisive, and ultimately more heroic. So, I'm afraid I found this Spano account a little disappointing for the most part. Complete Ballet in Three Parts. Laurent Petitgirard, Bordeaux Opera Chorus, Orchestre National Bordeaux Aquitaine. Naxos 8.570075. There is no doubt that Naxos produces more new recordings than any other record company, at least three or more of which I have the opportunity to hear and review each month. Most of them are competent in terms of sound and performance, but once in a while a disc stands out in one category or the other. 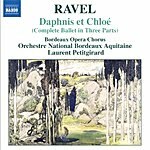 Such is the case with this 2006 recording of Ravel's Daphnis et Chloe ballet in terms of sound. Not that there is anything wrong with the performance. Petitgirard does a splendid job conveying the varying emotional subtleties of this pastoral Greek tale. It's just that the Naxos audio engineers have captured its sound with such a wide frequency response and such an ample dynamic range that the sonics tend to overshadow the musical interpretation. In fact, this is a clear case where a little of something, like the dynamics, may go a long way. Things start off very softly, so you can't blame the listener for wanting to turn up the volume, which would be a mistake because a few moments later the listener will be blown from his seat. Be that as it may, the Naxos disc's main problem is that its price point, $8.99 MSRP, comes into conflict with Pierre Monteux's celebrated 1959 recording (Decca), Charles Munch's Boston account from around the same era (RCA), and Charles Dutoit's newer digital rendering (Decca), all of them now available on mid-priced releases for about $8.98-$11.98 suggested retail. Back in the days when Naxos sold for $5.99 or even $6.99, they were terrific, bargain values, especially considering they were often discounted below five bucks. These days, they sell new for close to the same cost as most mid-priced discs, and, frankly, the competition in basic repertoire items like this one is murder. Works for solo piano by Stravinsky, Scarlatti, Brahms, and Ravel. Yuja Wang, piano. DG 000289 477 8795 2. Note: The following is an early review. DG will release the album April 13. I never heard Ms. Wang's first album of solo piano pieces, an album that earned her a Grammy nomination, but if it is anything like this one, it must be quite good, and together the two discs surely mark a commendable new talent. In an accompanying note, music critic Michael Church tells us that "Yuja Wang's title for her recording reflects the Buddhist idea that life consists of constant change." Thus, Ms. Wang presents the works of four composers whose music reflects such change. In the first place, several of the composers intended their work for a large ensemble and transformed it (transcribed it) for solo piano. 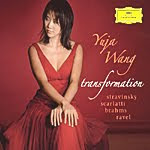 More important, Ms. Wang finds in each piece of music a rationale for transformation or change: "In Brahms transforming his theme 27 times; Ravel transforming the waltz by testing it to oblivion; and Stravinsky's puppet Petrushka being temporarily transformed into a human being before finally reverting to puppethood." I have to admit I find Ms. Wang's justifications for the disc's program a tad vague, but there is no questioning the repertoire selections themselves, which override any personal qualms about their inclusion. My only serious, if minor, concern after listening to the disc is that I found myself more or less admiring Ms. Wang's technical mastery of the piano without quite actually falling in love with the music. She is without doubt an accomplished and virtuosic player, but whether every listener will appreciate the feeling, the heart, behind her playing is another matter. While everyone will react differently to Ms. Wang's interpretations, I don't think anyone would question the fact that her pianistic skills are dazzling. The program starts out with a bang with Igor Stravinsky's own piano transcription of three movements from his ballet Petrouchka: "Danse russe," "Chez Petrouchka," and "The Shrovetide Fair." They are mostly lightning and thunder, with some finely tuned nuances thrown in. I'm sure Ms. Wang meant them to get the show underway in the manner of overtures, with plenty of expressive animation and bravura. Next comes the relative calm after the storm, Domenico Scarlatti's Sonata in E major, Andante comodo, a sweetly relaxed interlude before the big guns come out again, this time in the form of Johannes Brahms's twenty-seven Variations on a Theme by Paganini. Here, we're back to virtuosity and sparkling finger work. Ms. Wang maintains a proper rhythmic pulse throughout and an appropriate continuity among the assorted Variations, so the work is more of a piece than usual. The waltz is particularly charming, and the affair ends with a rousing, whirlwind flourish. After a second Scarlatti Sonata respite, the album closes with Maurice Ravel's La Valse, transcribed for piano by the composer. La Valse is delicately spooky and sinister, always reminding me of a scene from the movie version of Stephen Vincent Benet's "The Devil and Daniel Webster," where the devil's disciples come to take their victims off to hell during a formal dance, whirling around until they're dead. I found Ms. Wang at her most affective in this piece, the subtilties of her shading quite bewitching. I have not always considered DG's orchestral sound to my liking, but I have always enjoyed the way they've caught the sound of a piano. In fact, some of my favorite piano recordings are on DG, and this new one from Yuja Wang is no exception. The audio engineers appear to have miked the piano rather closely, yet it produces a pleasingly robust bloom, with a solid bass, an exceptionally clear and colorful midrange, and a slightly forward top end. For the kind of music making Ms. Wang engages in here--largely vigorous and stimulating--the sonics seem ideal, and if some listeners should find things a touch hard or bright, it's nonetheless probably what the actual instrument sounds like live. Also, Quintet for Piano and Winds, K.452. Dennis Brain, horn; Herbert von Karajan, Philharmonia Orchestra. EMI 50999 9 65936 2 2. Perhaps prompted by London's "Classic Sound," the DG and Philips "Originals," or the "Penguin Classics," EMI continues to re-release some of its best old material, this time in a line called "EMI Great Classical Recordings." Remastered at Abbey Road Studios from original master tapes via the Prism SNS system (ART, Abbey Road Technology), this is a series of discs that well deserves its title. There is certainly no denying that among EMI's re-releases, there are none that do not deserve mention among the great classical recordings of the twentieth century. At mid price, they are bargains. Which brings us to the subject at hand. 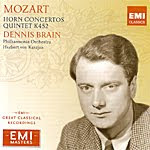 No musician was ever more closely connected with a particular piece of music than Dennis Brain and the four Mozart Horn Concertos. Before this pioneering monaural set from 1953, the Concertos were only of passing interest to most classical music fans. But Brain elevated them to near-cult status, and his recording of them has been in EMI's catalogue ever since. Indeed, it may be the longest-continuing title the company has ever produced. Of course, there are now dozens of fine recordings of the Concertos, yet Brain's interpretations remain definitive. They are graceful, effortless, relaxed, golden, honey-toned, resonant, perfectly rounded, and perfectly paced, accompanied by Herbert von Karajan at his most elegantly unobtrusive and the Philharmonia Orchestra at its height. EMI recorded the accompanying Quintet in E-flat for Piano and Winds in 1954 with the Dennis Brain Wind Ensemble, Mr. Brain and four colleagues, including his brother Leonard on oboe. This Mozart work, too, was somewhat overlooked by listeners until Brain made people more aware of it. While it does not appear to these ears among the composer's finest pieces of music, Mozart himself was quite fond of it, saying in a letter to his father that it was "the best work I've ever completed." Admittedly, it is light and charming, the piano dominating the music but with delightful little parts for the other instruments as well, including Mr. Brain's horn. The sound is monaural, as I say, and of no particular distinction, except that it is here remastered more smoothly and more quietly than ever. I've now owned at least four previous incarnations of these performances--on a full-price LP, a full-price CD, and I believe two mid-priced CDs before the present "Great Classical Recordings" disc--and this 2010 reissue, digitally remastered in 1997, is the best-sounding of them all (although, to be fair, it is the same mastering EMI used for their "Great Recordings of the Century" disc in 1998). In addition to the noticeable smoothness, however, there comes an apparent diminishing of high-end sheen, which may be actual or illusory depending upon what the original tape sounded like. In any event, if you don't already have these works, the newly reissued disc is well worth considering, mono or no. Also, Dance Suite; Music for Strings, Percussion and Celesta. Sir Georg Solti, Chicago Symphony Orchestra. Decca 475 7711. In the 1920s, Hungarian-born Georg Solti had been a student in one of Bela Bartok's piano classes and later, in the 1930s, had been a page-turner for Bartok during the Hungarian première of his Sonata for Two Pianos and Percussion. So, Solti had had an acquaintance with the composer, if ever so fleeting. Maybe because of this, Solti's two stereo recordings of the Concerto for Orchestra, first with the London Symphony Orchestra in 1965 and then with the Chicago Symphony Orchestra in 1981, display an ample understanding of the composer and his idiom. Decca chose to remaster the LSO performance in its "Legendary Performances" series a few years back, and more recently reissued the CSO performance (reviewed here) in their "Decca Originals" series. Solti's Chicago Symphony recording may not convey quite the same feeling as the earlier effort, because in the 1965 interpretation Solti allowed himself a moment's respite from time to time, slowing things down occasionally in order to better serve the dynamic and tempo contrasts. But there is no denying the newer account has a forward momentum that is quite pleasing, and with the music arising from dead-quiet silences, it is all the more effectively biting. 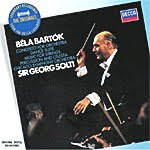 For a coupling, Decca provide Bartok's Dance Suite, of which I am not too keen but with which Solti does his best; and the Music for Strings, Percussion and Celesta, all weird and spacey and mysterious, with which Solti is a master. If I still hold Fritz Reiner's interpretations (RCA/JVC) of the Concerto and the Music for Strings in first place, it isn't by much. As for the audio, the CSO digital recording sounds pretty good, perhaps a result of the remastering, with good definition, those super-quiet backgrounds I mentioned, and fine spacial dimensionality. By comparison, the older LSO recording sounds a bit softer, a bit more natural in some places, but a bit leaner and fuzzier, too. Also, Violin Concertos RV 199, 347, 356*. Itzhak Perlman, London Philharmonic Orchestra, *Israel Philharmonic Orchestra. EMI 50999 9 65942 2 3. Since recordings of Vivaldi's Four Seasons appear so regularly, there's little point in my describing them. There must be a hundred discs currently available, most of them sounding pretty good, so the choice is wide open. You probably have a favorite recording of the piece, anyway, but in the event you don't, here is some gratuitous advice from one who has seen most of the last hundred recordings of the work go through his living room. First, be aware that the standard recordings of the four violin concertos comprising The Four Seasons fall into three broad categories, depending upon ensemble: chamber groups using period instruments, chamber groups using modern instruments, and full orchestras using modern instruments. For a period group I like La Petite Bande (Sony) for their lively, small-scale interpretation and transparent sound; and the Drottningholm Baroque Ensemble (BIS) for their unique style, creative playing, and equally outstanding sound. For a more-conventional period-instruments recording, a good, safe bet is the English Concert (DG Archiv), straightforward, fresh, and closely miked, but well recorded. Among chamber ensembles using modern-instruments, I like Marriner and the Academy of Saint Martin in the Fields (Decca) for their almost surrealistic approach to the score; I like I Musici's second recording with Michelucci (Philips) for their refinement and grace (and a slightly smaller ensemble); and I like Solisti Italiani (Denon) for their no-nonsense presentation. 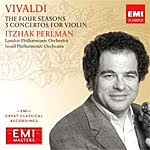 Which brings us in long-winded fashion to full-orchestral accounts using modern instruments and the disc under consideration, Itzhak Perlman's analogue LPO rendering from the mid Seventies. It is in a class of its own, and for years I have enjoyed it more than any other full-orchestral account. Now, understand, when I say full orchestra, I don't mean to suggest that the entire London Philharmonic was in on the project. The booklet insert does not say how many members of the orchestra participated, but I suspect the group had been pared down a bit, making the sound slightly leaner than it might have been otherwise. On the other hand, the accompaniment appears considerably fuller than on any of the chamber recordings, so I'm counting this as a full-orchestral account. Perlman is the solo violinist and the conductor in the performance, and the whole affair is as satisfying today as when I first heard it over thirty years ago. I've owned it on LP and on several previous CDs, and it continues to impress me. The interpretation may not be as vigorous as some of its smaller-ensemble rivals, but there's a elegance and serenity about it that's hard to resist. It is a smooth, relaxed, unforced, effortless reading that goes a long way toward negating any criticism of the work. What's more, EMI's analogue audio (recorded in 1976, digitally remastered in 1987, and reissued here in 2010) is vintage EMI, among the best you will find in this piece. Admittedly, there isn't a lot of deep bass or sonic impact, but there doesn't need to be; nor is there a lot of depth to the sound stage, but, again, there doesn't need to be. The violin is well integrated into the acoustic field, in front of the orchestra but not sitting in our laps, and the violin tone is pure and natural. It's clean, warm, clear sound that does nothing but contribute to one's enjoyment of the music. 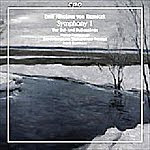 EMI recorded the three companion pieces--Violin Concertos RV 199, 347, and 356-- digitally a few years later (1982-83) with the Israel Philharmonic, and the sonics seem a bit edgier to my ears than the earlier analogue.. Nonetheless, they make good fill-ups. Also Symphonic Dance; Concert Overture 'In Autumn'; Old Norwegian Folksong with Variations. Ilse Hollweg, soprano, Beecham Choral Society; Sir Thomas Beecham, Royal Philharmonic Orchestra. EMI 50999 9 65934 2 4. 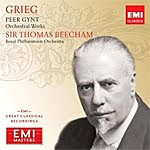 If you missed this recording of the Peer Gynt incidental music conducted by Sir Thomas Beecham when it first appeared on LP in the mid Fifties, and you missed its subsequent reissues on LP, cassette tape, and CD over the years, now is the time to pick it up in yet another incarnation, a part of the EMI Masters "Great Classical Recordings" series. The interpretation exudes the usual Beecham charm and has long been one of my favorite recordings in this music. Of course, Beecham does not give us all of the music Edvard Grieg (1843-1907) wrote for Henrik Ibsen's play, Peer Gynt. Beecham provides about forty-two minutes' worth. If you want the complete incidental music, you have to turn to people like Per Drier on Unicorn or Neeme Jarvi on DG. Beecham's extended selections are more like the suites, of which one can find any number of fine recordings. What Beecham brings to the table is his characteristic twinkle, lighting up the music with enchantment and charisma aplenty. And, naturally, the extended selections include Grieg's most-famous pieces: "In the Hall of the Mountain King," "Morning," "Ase's Death," "Arabian Dance," "Solveig's Song," "Anitra's Dance," "Solveig's Lullaby," etc. In addition, the disc includes Beecham's recordings of Symphonic Dance, the overture In Autumn, and the Old Norwegian Folksong with Variations. They may not be among Grieg's greatest achievements, but Beecham lavishes so much affection on them that even their most overly theatrical moments seem better than what they probably are. The sound, digitally remastered in 1998, is as good as ever, too, belying the 1955-59 recording dates involved. If you already own the '98 edition, though, you might want to hang on to it because I could detect no difference here. Also be aware that the audio engineers appear to have applied some small degree of noise reduction to the sound, resulting in a slight overall softening, some minor dulling of the original luster, especially in the midrange. Still, the album is better sounding than it has any right to sound, given its age, and is able to compete sonically and musically with any more-recent effort. Guitar Music of Latin America. David Russell, guitar. Telarc TEL-31979-02. The music is ravishing. There is really little more one needs to say about it. If you enjoy the guitar, playing or listening, you stand a good chance of enjoying this disc, which features a master guitarist playing some of the finest Latin-American guitar music ever written. 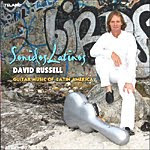 For his program, guitarist David Russell has chosen works from five famous Latin-American composers, and he organizes them by composer in the approximate order of their age. Because there are almost two dozen selections involved, I won't try to cover them all but, instead, highlight a few that caught my attention. The recital begins with the music of Paraguayan composer Augustin Barrios Mangore (1885-1944). Of the five pieces represented, all of which I enjoyed, I played the lively "Maxixe," the hauntingly beautiful "Confesion," and the sprightly, catchy waltz "Tu Imagen" again. And again. Next, we have the Mexican composer Manuel Maria Ponce (1882-1948), whom the great Andres Segovia inspired to write any number of tunes. Probably the standout is "Estrellita," a melody that became so popular Jascha Heifetz made it a hit in a violin transcription. It contains hints of Robert Schumann's "Traumerei" throughout, which is always a good thing. Russell plays the piece with obvious affection. After several works by Ponce, we find the Argentinean Hector Ayala (1914-1990), known for his tangos. Involved here is a series of pieces he did reflecting the styles of various South American countries, Series Americana. They are all lovely, if not quite so expressive or inspiring as the music of Ponce. Following those pieces, of the two works by the Brazilian Armando Neves (1902-1976), I enjoyed the "Valsa No. 3" best, a delicate waltz. Finally, we get music from the only living composer on the program, the Argentinean-American Jorge Morel (b. 1931). If you are a guitarist, you already know him. He is a highly popular musician/composer, with over a dozen solo albums to his credit. Two of the pieces David Russell plays are ones Morel dedicated to him. Of the five Morel pieces here, the poignant "Barcarole" stands out for me. What's more, the sound of the guitar is as radiant as the music and the playing, the Telarc engineers recording it fairly close up. Yet it retains a warm, smooth, almost mellow quality that nicely complements the music. As I said in the beginning, ravishing. Simon Trpceski, piano; Vasily Petrenko, Royal Liverpool Philharmonic Orchestra. Avie AV2192. These days it often takes a little something extra to sell a compact disc, especially when so many great artists have recorded most of the basic repertoire so well. I mean, what do you do when there are already classic recordings of the Rachmaninov Piano Concertos by the likes of Horowitz, Ashkenazy, Cliburn, Janis, Wild, Argerich, and, among others, Rachmaninov himself? The answer in the case of this Avie album is to couple the composer's two most-popular concertos on a single disc. Now, you'd think that would be easy, and everyone would have already done it by now. But that's not the case. The Byron Janis disc on Mercury Living Presence pairs the Second and Third Concertos, but most discs do not. The two concertos are popular enough by themselves to sell a single disc apiece, thus assuring a record company of doubling its profits. So Avie took the road less traveled and offer them together, the disc's running time a little over seventy-six minutes. Good for Avie. Maybe the gambit will pay off by selling twice as many CDs. 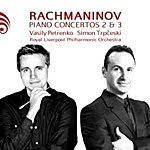 Anyway, Vasily Petrenko and his Royal Liverpool Philharmonic continue their coverage of Sergei Rachmaninov (1873-1943), this time with pianist Simon Trpceski. The composer famously premiered his Concerto No. 2 in 1901 after hypnotherapy. The failure of his First Symphony so shook him that he feared he'd never write another note of music, and he'd try anything. The hypnotherapy apparently worked because the result was the Concerto No. 2, an immediate success. While Trpceski misses a little something of the big, grand gestures we so love in Rachmaninov, he does catch the sweeping lyricism of the piece. He is most pleasing in the liltingly Romantic sections, where he lets his fingers fly off into dizzying flights of fancy. Needless to say, that means it's the dreamy second-movement Adagio that works best for him. Along with the Second Symphony, the Second Piano Concerto came to epitomize the Rachmaninov sound and style, and Trpceski and company do their best to remind us of this. By the time the Third Piano Concerto came along in 1909, it seemed like a continuation of the Second Concerto. The composer had obviously found his voice. Rachmaninov said he wanted the first movement to "sing," and so it does, in a soaring, graceful manner. The music is more serious and demanding than the Second Concerto, and Trpceski meets the requirement to the point of choosing to play one of Rachmaninov's more-intense alternative cadenzas, one even the composer found daunting. Again, Trpceski is a bit more at home in the melancholy second movement than elsewhere, and from there on it's a kind of headlong race to the finish, which is entirely Rachmaninov's fault so don't blame the piano player. The composer created a sometimes unwieldy third-movement Finale in which he seemed to be trying to outdo himself, leaving lyricism behind for dramatic, grandiose musical statements. Fortunately, Trpceski maintains an even keel without going overboard, even though the music is still a tad hectic. Avie recorded the two concertos in April and August of 2009 in Liverpool's Philharmonic Hall, and they obtained a slightly soft, thick, veiled orchestral sound to accompany the piano. Nevertheless, the audio engineers incorporate the piano exceptionally well into the mix. There isn't much orchestral depth behind the piano, though, nor, as I say, do we find much ultimate transparency. Maybe it's for the best because it forces the listener to concentrate on the primary instrument, which is as it should be. This is the sort of disc on which you have to turn the volume up a touch higher than usual for best results. Then, things come alive, with a wide dynamic range and a solid impact that are the dominant features of the sonic presentation. 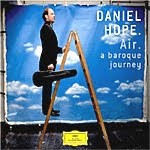 Daniel Hope, violin; soloists from the Chamber Orchestra of Europe. DG B0013993-02. Violinist Daniel Hope and soloists from the Chamber Orchestra of Europe offer up a deliciously prepared and expertly executed selection of diverse Baroque music. The idea, says Hope in the booklet note, is to show how music from different composers and different styles is really all connected, with each of the dozen or so Baroque composers lending a little something to the others to create their unique sounds. Hope also says the album is a way of showing off one of his favorite qualities of the violin, its "air" or ability to mimic the human voice. Hope chose all of the selections on the disc for their songlike characteristics, melodies he can play "airily," in a filmy, translucent, breezy style. 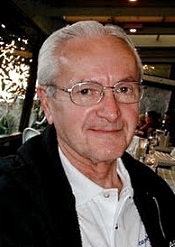 Certainly, the pieces he includes in the program demonstrate diversity, range, influence, and air, and they come to us not only from four cornerstones of Baroque music making--Bach, Handel, Pachelbel, and Telemann--but also a handful of lesser-known composers--Falconieri, Ortiz, Marini, Matteis, Westhoff, Geminiani, Valente, and Leclair. Meaning that most listeners will instantly recognize some of the music and perhaps not recognize much of the rest. Whatever the case, the disc includes some fine music, if somewhat fragmented despite Hope's desire to demonstrate their linked associations. Let me give you a few instances: Things begin with the Ciaccona of Andrea Falconieri (1585-1656), which starts out very gently and gets more animated as it goes along, with a strong, if repetitious, forward pulse. In itself, it's a fine, demonstrative way for Hope to launch the program. Hope follows that with Handel's familiar Sarabanda, a serious piece that makes a good contrast to the Falconieri work, with Hope providing a mournful, soulful violin sound even when the music lightens up. Following the Handel, we get the lively Ricercata segunda by Diego Ortiz (1510-1570) and then another piece by Falconieri, this time a sweet, smooth tune called, appropriately, La suave melodia. Often, the music lifts off in flights of fancy, but mostly it remains in the lilting, yearning confines of the here and now. The little Violin Concerto in A minor by Georg Philipp Telemann (1681-1767) is a good example, parts of it deeply expressive and other parts most playful. Hope then elects to follow the Telemann with a piece by Johann Paul von Westhoff ((1656-1705) called Imitazione delle campano that is really quite modern in its tone and structure. And so on. After a variation on Greensleeves (anon.) and several more pieces by Westhoff, Hope concludes the album with Bach's Air from the BWV 1068 Overture. What better way to end an album devoted to violin "airs" than with the most-celebrated air of them all? As to DG's sound, it is oddly soft, veiled, and somewhat distant for so small a group of players. Nevertheless, the engineers properly integrate Hope's violin into the context of the ensemble, and the instruments themselves appear well balanced within the acoustic setting. Perhaps Hope and the audio engineers intended the low-key quality of the audio to complement the music. It is doubtless a warm, relaxing sound rather than anything one might play as demo material. John O'Conor, piano; Andreas Delfs, London Symphony Orchestra. Telarc 2CD-80704 (2-disc set). 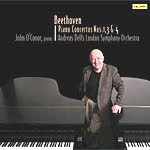 Irish pianist John O'Conor is a most poetic instrumental interpreter. Here, his Beethoven is best in the slower movements, where his lyricism has the upper hand, but he invests the outer movements with plenty of gusto as well. It's just that even when he's letting loose, he's still singularly rhapsodic, gently caressing each note and coaxing a freshly idyllic feeling from the most oft-heard passages. In other words, O'Conor produces some lovely Beethoven. This is most evident in the First Concerto, with its lively, joyous tunes, and in its extreme opposite, the Fourth Concerto, with its dark, somber, sometimes solemnly introspective undertones. Obviously, O'Conor is in command of both worlds and both moods. Quite lovely, really. Unlike O'Conor's playing, though, which has an immediately gratifying effect, Telarc's sound has to grow on you. It hasn't quite the warmth I expected in the mid bass, and it seems a little hard and forward in the upper midrange, producing a feeling of leanness that might not be fair. It's not really lean, nor does it lack warmth. They are simply first impressions. I also thought there was a little too much orchestral depth behind the piano, which was quite surprising since usually I find too little in most recordings, but that feeling quickly disappeared, too, as I got more into the music and the performances. 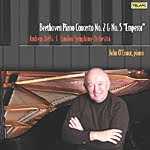 While maybe this isn't the most transparent sound I've ever heard, it is natural enough to enhance one's enjoyment of the music well enough, making these performances from John O'Conor and the LSO serious contenders for one's Beethoven bucks. O'Conor is not brawny or clever or grand or coy, but I guarantee you'll be swept away by his music making. John O'Conor, piano; Andreas Delfs, London Symphony Orchestra. Telarc CD-80675. The booklet insert notes that Irish pianist John O'Conor "...has taken on the mantle of his revered professor Wilhelm Kempff and gives the annual Beethoven Interpretation Course in Kempff's own villa in Positano, Italy, where Kempff gave the course from 1957." Naturally, after listening to O'Conor's performance of the "Emperor" Concerto, I turned immediately to Kempff's classic recording on DG Originals, and I found the two men's approach to the music quite similar. They both grant the work its grand scale, but, more important, they provide it with the poetry it needs in the second movement Adagio and in bits and pieces of the first and third movements to make this work the forerunner of all other big Romantic piano concertos of the nineteenth and twentieth centuries. After all, without the "Emperor" of 1809, could we really have expected the concertos of Schumann or Grieg or Tchaikovsky or Rachmaninov and so on? So, O'Conor's reading is expressive yet eloquent, sweeping yet lyrical. You couldn't ask for much more than that. Moreover, the coupling of the Second Concerto is equally well played, and even if I don't personally care much for its first two movements, O'Conor brings out all the delightful playfulness of the concluding Rondo. Supporting O'Conor's fine performances, maestro Delfs, and the LSO is Telarc's audio quality. I must admit that over the years the company hasn't always produced discs that sounded as good to my ears as I'd like, but this one is excellent. The tonal balance is quite neutral, the transparency is everything it should be, the dynamics are first-class, and the orchestral depth and spread are exemplary. My only quibble is that I would have preferred the piano to be more in the middle of things than it is here, which is slightly to the left of center. Nevertheless, the piano is well integrated into the orchestral picture, making the recording an all-around good contender in this field. In other words, O'Conor's rendering can compete against the best--Kempff, Kovacevich, Arrau, Ashkenazy, you name them. John Donne notwithstanding, I sometimes feel that I AM an island. I am alone. Like Joe Heller's Yossarian, I get the feeling I'm the only sane music listener left in a "Catch-22" musical world gone bonkers. Here's my point: Maybe I'm the only living human on the planet who still considers that both the recorded performance of a work and the sound of the recorded work should be kept in some kind of proper perspective. What's more, I think my island is sinking. It seems like about ninety percent of the people in this world simply don't consider music important. Fair enough. In fact, most of the time they probably don't consider music at all. Where do I get these statistics? Don't be impertinent. I write for the Internet; I'm an expert. (I make stuff up like everybody else.) If people do listen to music (and most people in affluent countries have stereos, surround-sound systems, iPods, and the like), it seems to be as a background while they're doing something else; the music is no more than wallpaper while doing the dishes, dusting the furniture, or reading the paper. For the few people who do take music seriously (making up, what, nine and nine-tenths percent of the population? ), the actual sound of the music seems of little importance. These folks may even be the music lovers I described in Part 1, who hide their speakers under a couch or behind a tree; or the people who carefully position their audio gear for optimum stereo effect and then listen from a favorite chair two feet to the outside of the left speaker. Finally, there are the members of the one-tenth of one percent of listeners who constitute the loopy rim of audiophiledom, the people who spend all their time diddling with the audio and never listening to the music. That's the same small group, by the way, who have been buying the same expensive, high-end components for the past forty years, recirculating each piece of gear among themselves like that solitary fruitcake that gets passed around through twenty million people at Christmas time. So, why should people sit in the "sweet spot" to listen in front of and between their two or three main speakers at all? For me, I find that I can only do an unbiased music evaluation if I'm listening to sounds that have some basis for comparison in reality. I need to be able to simulate a live musical event from the best seat in the house. And said realistic sounds must be unamplified in real life for the comparison to be fair. This would seem to me to limit serious listening comparisons to human voice, classical, acoustic music, and jazz. Pop and rock are out as serious contenders for comparison tests, as are listening through earbuds, headphones, iPods, portable devices, car radios, and the like. Narrowing it further, the good folk who listen using the criteria I described must also have good audio equipment, well positioned, and well tuned. Then, such listeners must be willing to sit in front of their speakers in a one-and-only listening position, the so-called "sweet spot" I mentioned earlier, while concentrating on musical works in their entirety. As I've said, this leaves out almost everybody but yours truly, since I am the only musically-meditating Norwegian-Italian monastical mystic I know of who sits and listens for hours from the best spot in the house. Yeah, I fell asleep for a twenty-minute stretch recently while listening to the complete tone poems of Franz Liszt. But I try. 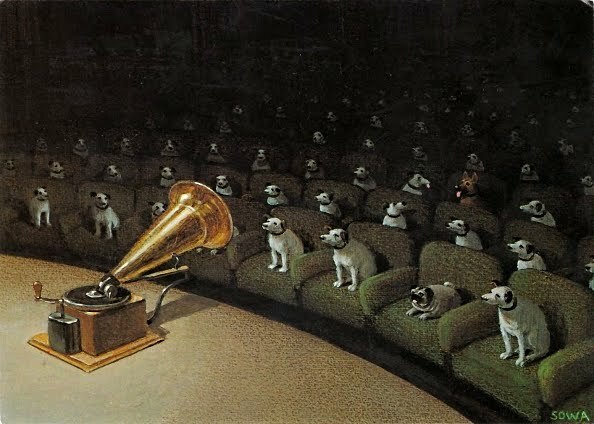 I have a friend who once owned a hi-fi shop. I asked him at the time what kind of speakers he used at home. He said the cheapest possible. Why? Because he never listened at home. After eight hours a day listening in the shop, do you think he wanted to come home and listen some more? A few years ago I visited another friend, an opera lover, to hear his system. I noticed immediately that his speakers were out of phase. Being presumptuously rude, I told him so and asked him if he wanted me to correct them, which I did. He had probably been listening to these speakers out of phase for years, with sounds coming out of everywhere. Worse, when he heard his speakers properly phased and precisely imaged, he didn't particularly like the new sound. Yet another friend, a non-audiophile, recently bought a pair of new speakers, and I had the chance to see and hear the setup. You guessed it. The speakers were lying sideways, one inch off the floor in a corner bookshelf and facing each other at a 90-degree angle about three feet apart. Behind a chair. Everyone I know owns a two-channel stereo or a surround-sound system. But, to the person, they do not listen to complete pieces of music while sitting in front of and between the main speakers. OK, one person. He has a huge music collection, a great stereo system, and listens carefully. One other person. Wait a minute. If I multiple each of us by that one person we all know who listens sensibly, maybe I'm not alone. Thanks, Doc. I'm cured. But I'm still rowing for Sweden as fast as I can. Listen up, people. The subject in question today is how we listen. More specifically, how do audiophiles and music lovers listen to music in the home? I ask the question because I don't believe that most people listen to music while sitting in the "sweet spot" between their two main stereo speakers or in the absolute center of their surround-sound system, as the case may be. I had always taken the assumption for granted that audiophiles and music listeners did, indeed, sit and listen to their music from the optimum listening position. But if that's not true, just how do people listen seriously to music and why do they listen that way? OK, iPods, earbuds, portable players, car stereos, and the like we can eliminate from the discussion at the start. 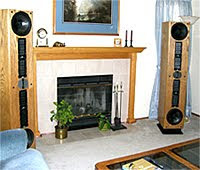 I'm talking here serious music listening in your living room, listening room, music room, media room, or home theater, with most audiophiles probably still listening to a pair of well-placed stereo speakers. I started to think of the various music systems I had encountered over the years, and the way their owners listened to them. I remembered one system I saw in a home not far from my own. The system featured a pair of Martin Logan electrostatic speakers and Audio Research electronics; pretty impressive from a monetary standpoint--probably twenty grand, at least. Appropriately, the owner had positioned the two speakers well away from any potentially reflective walls; so far, so good. But then I noticed they were no more than four feet apart, and there was no furniture whatever in front of them, just a couch and chairs along the side walls and a large hallway entrance in the wall opposite. The only listening position that could possibly provide any stereo realism would have the listener sitting on the floor, four or five feet in front of the speakers. And then most the sound would be blowing over the listener's head. What was going on here? How do people listen? I have also found two-channel stereo systems with the two speakers literally sitting on top of one another. Now, I remember in the Sixties the fad of stacking Advents on top of one another; but at least this was a pair of stacked speakers on each side of the room, not one stacked pair in the middle. One fellow a few years ago asked me over to listen to a new chamber piece he had just bought. When I arrived, I was slightly taken aback to find he had placed one of his small bookshelf speakers on the top right of his fireplace mantel and the other to the left of the fireplace and on the floor. When I asked him, as diplomatically as possible, if he had ever considered putting both speakers on the mantel, or both on the floor, he stared at me for moment, almost in disbelief, and said no, he'd never thought of it. What was going on here? Some time back I was at a friend's house, and he invited me into his living room to listen to some music. He was proud of a new stereo setup he had just bought, and he was anxious to show it off to me. The equipment was quite good. But one speaker was on the floor behind his favorite chair and the other was across the room behind a couch. He said he liked the surround-type sound these positions provided. I said I guessed he didn't care much for sonic realism. He didn't seem to know what I meant. Then he said something I found a bit odd. He said to me, "You're one of those guys who sits and listens to music without doing anything else, aren't you?" I had to admit I was. He went on to say, "That's a little like meditation, isn't it?" I supposed it was. So, why do so many people spend so much time, energy, and money on high-quality sound equipment if they only listen to the music in the background or while visiting with friends? Seems a waste. A couple of hundred dollars at Radio Shack would suffice for me if I were interested only in playing music while I was doing something else. What's the point of having a good playback system if you can't actually hear the stereo spread, and what's the point of "high fidelity" if you are not focusing on the quality of the sound? Is it extreme to think that serious listeners really concentrate on music alone? Would most people consider this akin to meditation? More ramblings to follow in Part 2. Also, Concerto-Rhapsody for Cello and Orchestra. Dmitry Yablonsky, cello; Maxim Fedotov, Moscow City Symphony Orchestra. Naxos 8.570463. Much of the music of Armenian composer-conductor Ayam Khachaturian (1903-1978) seems to me noisy and bombastic, and some of it even at its best, as in the ballets Gayaneh and Spartacus, can be a little tiring. But his Cello Concerto of 1946 was so out of line with the traditional guidelines of the Communist Party that they ousted him from the Composers' Union over it (among other things). I must admit I have never been too fond of the piece myself, although the present recording goes a fair way toward helping to change that opinion. The first movement of the Cello Concerto is all over the map: It starts out dark and threatening, it lightens up, it gets bouncy, it takes on a Gypsy flair, it turns sinister, then martial, you name it. Khachaturian studied cello for several years while in his early twenties, so he knew the instrument and how best to employ it. Nevertheless, here the cello seems barely able to keep up with the rest of the music. 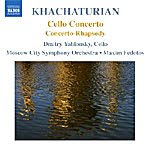 The booklet note tells us that the Cello Concerto never caught on with the public any more than it impressed the Soviet overseers in things musical, the note suggesting that the reason was because Khachaturian used the Concerto to continue "the emotional unease of the wartime Second Symphony" of a few years earlier. Fair enough, especially when one remembers that the public wanted to forget the War as soon as possible. The slow second movement Andante is quite atmospheric and expressive and sounds as though it might serve as the musical score of a mystery thriller, a film noir perhaps. You just about see John Garfield or Robert Mitchum lurking in the shadows. The mellow sound of Dmitry Yablonsky's cello perfectly complements the mood of the section. The concluding movement begins in a zippy fashion, with Yablonsky taking great relish in the music's eloquence and bustle. As the tempo continues to build, the players maintain the momentum of the mounting tension. The piece ends on a high, if not quite fever, pitch. If the Cello Concerto can sound somewhat harsh and off-putting to some listeners, the composer's Concerto-Rhapsody from 1963 is more approachable. It is more flowing, more harmonic, more poetic, and more impassioned than the Concerto. It's single, twenty-odd-minute movement contains some lovely passages for the cello and nicely showcases Mr. Yablonsky's virtuosity. The cellist provides all the grace, enthusiasm, and verve the music demands, producing a more-accessible work than the Cello Concerto. Yablonsky, Fedotov, and the Moscow City Symphony Orchestra work impressively together and create a strong degree of spark and sparkle in their music making. Recorded in 2007, the sound is typical of Naxos's better efforts. It's clear and well balanced, with the cellist placed front and center and the orchestra properly spread out behind him. While there is not the greatest amount of orchestral depth nor the most-extensive transparency involved, it's a reasonably realistic presentation, lacking maybe the last ounce of dynamic range, frequency response, and impact. The cello itself, however, appears quite natural, and the solo parts stand out exceptionally well. Also, Rimsky-Korsakov: Quintet in B flat major. Wolf-Quartett; Kammerensemble Classic der Deutsche Oper Berlin. NCA 60175. The actual name of this album is Klang Der Welt: Russland (Sounds of the World: Russia), but I thought if I listed it that way, nobody would know what it was about. In any case, the Orchestra of the German Opera Berlin are presenting a series of concerts devoted to the music of various countries of the world, and here we get some of the chamber music of Russia, very well performed and recorded. First up is the String Quartet No. 2 of Alexander Borodin (1833-1887), performed by the Wolf-Quartett, presumably members of the Chamber Orchestra Classic of the German Opera Berlin, but the booklet notes are a little vague on the subject. In any case, the performance is about as perfect technically and sonically as one could ever expect it to be. In fact, it's downright gorgeous. The Wolf-Quartett play with absolute precision, which the nitpicker might say spoils some of the performance's spirit and spontaniety, its being even a bit strait-laced, but with music this beguiling and this well executed, any complaints, no matter how minor, seem petty and petulant. The Quartet's first movement flows sweetly, with its abundance of Russian folk melodies. The Scherzo that follows maintains the music's easy flow, without any disruptive rambunctiousness. The third movement Nocturne is undoubtedly the most-famous segment of the work and one of the most-popular pieces of music Borodin ever wrote; indeed, it is so popular that one often hears it played by itself in collections of chamber music. The Wolf-Quartett do it justice in a performance of lilting lyricism. Then we find a little more abandon in the Finale, which the members of the Quartett seem to take great pleasure in presenting. The second and final item on the disc is the Quintet in B flat major for Piano, Flute, Clarinet, Horn and Bassoon by Nikolai Rimsky-Korsakov (1844-1908). Like Borodin, Rimsky-Korsakov was a partner in the "Mighty Five" or "Group of Five" Russian composers intent on maintaining the tradition of purely Russian music separate from undue outside influences. Thus, we again find an wealth of Russian folk tunes involved; however, that does not mean the piece is any way overly rustic or simplistic. The booklet, still vague on these matters, does not specify the performers, but one assumes they are members of the Chamber Orchestra of the German Opera, and they are every bit as precise in their delivery as the Wolf-Quartett. While Rimsky-Korsakov's Quintet may not be quite as inspired as Borodin's Quartet, it does offer a little something for everyone, especially from the bassoon, which adds familiar and playful touches throughout. There is a lovely, longing quality about the middle movement, nicely felt and judged by the group. Finally, the third movement takes us back to a lighthearted bounce, the bassoon continuing to lend a kind of goofy grace to the proceedings. The SACD multichannel sound (which I listened to from its regular two-channel stereo layer) is slightly close but not objectionably so, spreading out agreeably between the speakers, making the four and five players sound like a bigger ensemble at times. Be that as it may, it's a warm yet vivid sound, very natural, very smooth, and very listenable, with a somewhat subdued but definitely pleasant acoustic bloom. Fans of chamber music should savor this disc. Also, Four Songs. 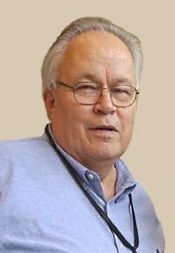 Frank Beermann, Brandenburgisches Staatsorchester Frankfurt. CPO 777223-2. If it weren't for the overture to Donna Diana (for which I am forever grateful to Sergeant Preston of the Yukon), many of us would probably never have heard of the Austrian-born composer and conductor Emil Nikolaus von Reznicek (1860-1945). Understandably, as most of his music went in and out of even the German repertoire rather quickly. The Symphony No. 1 is a case in point. Resnicek wrote it in the early twentieth century, Felix Weingartner first performed it in 1903, and then it quickly disappeared. It only reemerged in the 1980s, and American conductor Gordon Wright gave it its first modern performance in the early 1990s, nearly ninety years after its première. I'm not sure it deserved its luckless fate, but it is, after all, hardly a work one can call memorable. 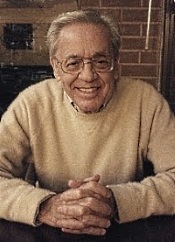 According to the booklet note, Resnicek intended the symphony as absolute music, with nothing more to guide a listener than the subtitle "Tragic" and a fleeting reference in the first movement to a tragic hero. Yet the composer goes on, nonetheless, to provide a program for the music, so broad it could mean almost anything but indicating certain psychological progressions from tragedy to heaven-knows-what. The work opens with a kind of fate-like theme that reflects echoes of Mahler, Bruckner, even Tchaikovsky, intertwining melancholy with despair. The second movement Scherzo, however, is all busy-bee, flitting hither and yon like one of Mendelssohn's sprites. The third movement Adagio changes the tone to one of wistful longing, some of it reminding a person of a lonely forest scene. Then the Finale wraps things up with dark, nighttime landscapes and quasi nightmares. There must be a degree of comfort for a conductor like Frank Beermann, being among the only people ever to perform the work (and one of the few people to record it), since it gives us nothing, really, with which to compare it. We'll have to take Beermann's word on how it's supposed to go. On the minus side, I found the symphony fairly conventional in style and structure, with only moments of inspiration. Fortunately, Reznicek uses some imaginative orchestration, so the piece is never actually boring. And CPO's engineers do a decent job recording it, especially the midrange and treble, which are quite transparent, if a little forward. They could have done a little more with the bass, however, because that end of things goes wanting. Daniel Barenboim, Staatskapelle Berlin. Warner Classics 2564 64316-2. Another Mahler Ninth. The composer's continuing popularity goes unrestrained, probably because he offers so much, from the subtle to the grandiose, from the sublime to the bombastic. Certainly, the Ninth, Mahler's last completed symphony, contains a little of each, yet it does so in the most-moving manner of all his works. 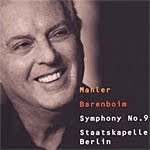 Which is what I missed most about Barenboim's recording with the Staatskapelle Berlin. While every note is polished and in place, the whole failed to moved me. The Ninth has always been more than a little problematical. One can interpret it as expressionistic and optimistic, a journey into light, ending in sweet and everlasting repose; or it can be seen as pessimistic, a view of degeneration, death, and decay. I favor the optimistic view, but I can understand how at the time of the work's composition in 1909, Mahler was aware that he was gravely ill, and that he may also have foreseen the coming of the Great War and the end of civilization as he knew it. So, there is every possibility of reading the symphony optimistically or pessimistically. I see the opening and closing movements as so relaxed and serene, they can only be an admiration of life and all its beauty, followed by a resignation of life's passing and a kind of contentment with what is yet to come. In the two middle movements, Mahler comes up with a typically bizarre and unruly set of Landlers, waltz-scherzos, and parodic Rondo-Burleskes. Frankly, only these middle movements under Barenboim worked for me. But even they seem forced and overemphatic. I was not touched by the outer movements as I should have been, nor was I too fascinated by the inner ones. Not a good sign. Of course, I may be spoiled by the classic performances of Barbirolli and the Berlin Philharmonic (EMI), Haitink and the Concertgebouw (Philips), Klemperer and the Philharmonia (EMI), and both Abbado and Bernstein with the BPO (DG). In those hands, the symphony reaches great heights and leaves one with a lasting impression of beauty and calm. Barenboim simply left me admiring its technical accomplishment. Warner Classics recorded the performance live in 2005, but you don't hear a peep from the audience, and, thankfully, there is no closing applause to ruin the mood. The sonics are fine, although a tad close, with what sounds like a slightly elevated upper bass and a distinct presence in the upper midrange. The result is a touch cloudy and bright, but I'm sure the acoustic remains fairly faithful to its concert-hall setting. Also, The Isle of the Dead; The Rock. 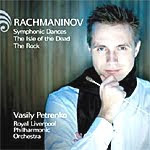 Vasily Petrenko, Royal Liverpool Philharmonic Orchestra. Avie AV2188. It was a gutsy move for Avie to attempt a new recording of Rachmaninov's Symphonic Dances, given that there are already several outstanding recordings available. Among previously available accounts, Andre Previn's LSO rendition on EMI has long stood the test of time, and Eiji Oue's rendering with the Minnesota Orchestra on Reference Recordings is probably on every audiophile's shelf. Nevertheless, the Royal Liverpool Philharmonic under their new, young conductor Vasily Petrenko make a good showing for themselves, and on sheer energy alone they may win the day. Sergei Rachmaninov (1873-1943) wrote his Symphonic Dances late in life (he premiered them in 1941), initially intending them as a part of a ballet project that fell through. The three dances that remain in the suite have been in the repertoire ever since, and the public probably knows them as well as they do the composer's Second Symphony or Second and Third Piano Concertos. Petrenko invests the first of the Dances with enormous passion, the powerful, thrusting opening section practically knocking the house down. The more hushed, meditative passages the conductor takes perhaps a bit more hurriedly than I'd like, building tremendous power and spirit in the big boisterous outer segments, while not quite reining things in enough in the more wistful themes. The second movement Waltz is appropriately weird, a bizarre combination of Mahler and Saint-Saens, with a hint of Mussorgsky thrown in. Still, it's unmistakably Rachmaninov in the Romantic middle portion, which tries in vain to break through. This movement is also Petrenko's finest hour, as he captures well the eccentricities of the piece. The finale, which Rachmaninov originally titled "Midnight" as part of a three-movement scheme that included "Noon" and "Evening" as the stages of progression through life, may be a reflection on Man's mortality. It's part demonic dance and part lament, with the recurring "Dies irae" theme always present. Petrenko ends it in a huge burst of pent-up energy that reminds us that his reading of the Symphonic Dances is more overtly volatile and heart-pounding than it is particularly lyrical. Accompanying the Dances, we first find The Isle of the Dead (1906), a work Rachmaninov based on a painting he saw of the mythological Charon ferrying souls across the River Styx to the Isle of the Dead. You can guess how the composer's imagination soared, producing a tone poem of eerie, brooding magnitude, with his favorite "Dies irae" chant again a part of the plan. It's a fairly slow, gloomy affair that is only occasionally mesmerizing; however, Petrenko does his best to pull it off effectively, injecting it with all the adrenaline he can muster. Whether he succeeds or not may depend upon how well you like the music in the first place. Finally, we get The Rock, an early orchestral fantasy from 1893, which attempts to encapsulate an entire Anton Chekov short story as well as describe the first few lines of a poem by Mikhail Lermontov. That's quite a lot, actually, for a thirteen-minute musical composition. Like The Isle of the Dead, The Rock is a rather melodramatic affair, and again Petrenko plays up the contrasting tensions, this time with a little more success. In keeping with the vigor of the music, Avie provide the sonics with a prodigious dynamic range and impact. Recorded in 2008-09, the sound is quite clean, with very little bass overhang to cloud the midrange. I would have preferred a bit more smoothness at the top end, though, a bit more ambient bloom, and a slightly greater orchestral depth, especially in the Symphonic Dances. But I quibble; it's a fine recording, and The Isle of the Dead in particular has plenty of warmth. Garry Clarke, Baroque Band. Cedille Records CDR 90000 116). The first thing you should know about this album is that Cedille's Bill Maylone engineered it, which means right away that it ought to be of interest to audiophiles. Second, it features Chicago's Baroque Band, a relatively new period-instruments ensemble that plays with style and passion. And, third, it contains the music of Bohemian-Austrian composer Heinrich Ignaz Franz von Biber (1644-1704), whose work may be unknown to most listeners but is certainly worth enjoying. Let's look at these items in reverse order. Biber is probably the most-famous seventeenth-century composer you've never heard of. Twenty-odd years ago, the world had practically forgotten him, but thanks largely to the period-instruments movement, his star is beginning to brighten once more, and there are finally a few recordings of his stuff around. Count this newest disc from Cedille among the better ones. 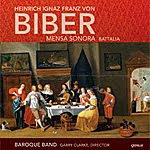 The album begins with Biber's Mensa Sonora ("Sounding Table") from 1680. It's a set of six Parts or suites of five-to-seven movements each, written by Biber most likely as background dinner music for large gatherings, maybe at court. Clarke explains in a booklet note that on most other recordings we hear the music played by smaller groups than the fifteen or so performers in the Baroque Band, but he justifies his larger ensemble performing it by suggesting that Biber undoubtedly intended the music for a larger band if possible, anyway. Certainly, the larger group makes the music sound richer and more robust. The various movements of Mensa Sonora are mostly lively, catchy, entertaining...and wholly forgettable. It really wasn't meant to be heard and analyzed; people were probably eating dinner while it was played, after all. You'll hear the usual array of alamandas, sarabandas, gavottes, gigues, ballettos, arias, sonatinas, and the like here, reminiscent of much French dance music of the day. Each listener will have his or her own favorites, of course; mine is Pars II in F major, where the melodies seem more innovative, more refreshing, more colorful, and more individualistic than most of the rest of the suites. Admittedly, much of this music does sound alike to me, but I could say the same about most types of music. Much jazz, pop, and rock sounds alike to me, too, when it's not distinguished by some shade of genius. The second item on the disc is Biber's Battalia from 1673. It's his little programmatic "Battle Symphony," predating Beethoven's Wellington's Victory by over a hundred years. The music describes a battle and the activities of the soldiers in it. We hear the marching of the soldiers to the front, the cannon and musketry, and the shouting and bustle of the troops, preceded by a humorously drunken party and ending in a lament for fallen comrades. Although it's brief at only a little over eight minutes, it's a delight with all its folk music and knocking about (literally, with the musicians banging on their instruments to simulate the sounds of war). The Baroque Band is the brainchild of British violinist and period-instruments exponent Garry Clarke, who came to Chicago in 2007 and founded the group. The fifteen or so members seem to be enjoying themselves immensely in the music, especially in the Battalia, and provide a variety of stylish touches throughout the program. Along with Boston Baroque and Philharmonia Baroque, they are a welcome addition to America's elite period-instruments crowd. Recorded in 2008 and 2009, the Cedille sound is exceptionally clear and sparkling, with separate instruments well delineated and the bass line cleanly articulated. The harpsichord gets a prominent position in the middle of the group, yet it is never overpowering. What's more, because it is a small ensemble, orchestral depth is not an issue, and the players are well spread out between the speakers, miked fairly closely for maximum effect. Sibelius: Violin Concerto in D minor, Op. 47; Humoresques Nos. 1, 2, and 5; Prokofiev: Violin Concerto No. 1 in D, Op. 19. Vilde Frang, violin; Thomas Sondergard, WDR Symphony Orchestra Cologne. EMI 50999 6 84413 2 6. Following the custom of the past few decades, this disc marks the recording debut of a talented, young, and beautiful violinist. The cynic might say these are the very qualities chosen by record companies to sell discs, but there is no question about Norwegian-born Vilde Frang being genuinely gifted. Let's just say the fact that her picture also makes an attractive album cover is icing on the cake. Jean Sibelius (1865-1957) wrote his Violin Concerto in 1903, revising it in 1905, and it's been going strong in the repertoire ever since. Ms. Frang takes a far sweeter and more relaxed view of it than does Heifetz in the classic stereo recording I'm used to hearing, which is colder, more hard edged, and more thrusting. Not that Ms. Frang doesn't open things up as the Concerto goes on, but it is the soaring lyricism of Frang's interpretation that lingers on in memory. While I wouldn't go so far as to say she sentimentalizes the music, she does caress and finesse it lovingly enough possibly to make a believer out the composer's most-hardened critics. That is to say, for those listeners who usually find Sibelius a little too icy, this recording may be the perfect solution for them. The second movement Adagio is as purely Romantic as anything Sibelius wrote, and Ms. Frang exploits just that feature. In the final movement, Sibelius adopts a more driving tone, and here Ms. Frang becomes appropriately more animated. The music commentator Donald Tovey once wrote that the Concerto's finale possessed "...the spirit of a polar explorer. [The finale] evidently a polonaise for polar bears...." Cute line, and I suppose it applies playfully enough here. Sergei Prokofiev (1891-1953) wrote his First Violin Concerto in 1914. Usually, its opening section sounds more Romantically inclined than the Sibelius, but with Ms. Frang they're both quite similar in their gentle repose. The violin glides along like a bird on the wing, soaring, climbing, and darting as the music demands. Oddly, Prokofiev wrote the middle segment as a brief Scherzo rather than as a traditional slow movement. The composer was full of surprises, and Ms. Frang plays it with evident pleasure. The closing Andante is darkly misty, with yet a moderate pace, and again Ms. Frang's stylish performance wins one's heart. Filling out the program, we find three short, charming gems, Sibelius's Humoresques for violin and orchestra. I wouldn't call any of the interpretations on the disc definitive, but they are certainly engaging and delightful. Sonically, mark this 2009 recording as one of EMI's better efforts, well within the mold of their best work of the Sixties and Seventies. We hear a wide stereo spread; a big, open sound field; a strong dynamic impact; a pleasantly warm, ambient bloom; and a decent sense of depth. My only concern is that the violin seems placed too far to the left, slightly upsetting the symmetry of the music's tonal balance; nevertheless, the violin is well integrated into the orchestral setting, with just enough transparency on the strings to simulate a realistic violin sound. In all, violin placement or no, the audio does justice to the reading.